Tony Beltran is back for Real Salt Lake, but can he recapture the form that made him one of MLS’s premier defenders? Trent Nelson | The Salt Lake Tribune Real Salt Lake's Tony Beltran at the club's media day in Sandy, Saturday January 23, 2016. Day after day last season, as each member of Real Salt Lake completed their workout and walked out to the fields of the Herriman training facility, Tony Beltran sat and watched. It’s all he could do. The 31-year-old veteran was recovering from a devastating knee injury that was scheduled to keep him out at least nine months. It was agonizing for him watching every teammate that walked freely outside and onto the pitch where they would run, cut and jump effortlessly. “I felt like half a man,” Beltran said earlier this month as he sat next to his wife, Teal, in the dining room of their Sugar House home while his infant son, Kaito, slept soundly in the next room. For months, he watched. For months, he doubted himself. The first time he tried running after undergoing two surgeries, he was convinced he would never return to playing at a high level. But after more than a year of being confined to training tables and watching the sport he loves from the sidelines, Beltran made a roster appearance in the final game of the 2018 season. It marked the return of one of RSL’s legends who has spent his entire career with one team. It was a reward for the work he put in. But he wants more. The injury is seared in Beltran’s mind like an annoyingly catchy pop song. It was mid-October 2017, and RSL was in Colorado playing the Rapids. Joao Plata had tried to score and Beltran looked to clear the ball — a movement he had performed “thousands” of times in his career. But this one play went awry. As Beltran swung in one direction, a defender swung in other, making contact with his knee in just the right spot to send him crashing to the field in agony. In a flash, Beltran thought about how the injury would affect holding his son, who had been born just four months earlier. He thought about how it would affect his family life. He regretted not being able to keep a previously scheduled postgame meeting with the owner of a book company he supports. Eventually, Beltran learned the full extent of the blow: a torn ACL and LCL, an LCL bone avulsion and a posterior lateral corner tear. Andrew Cooper, RSL’s orthopedic surgeon, decided it would be best to repair Beltran’s knee with two surgeries staged six weeks apart. 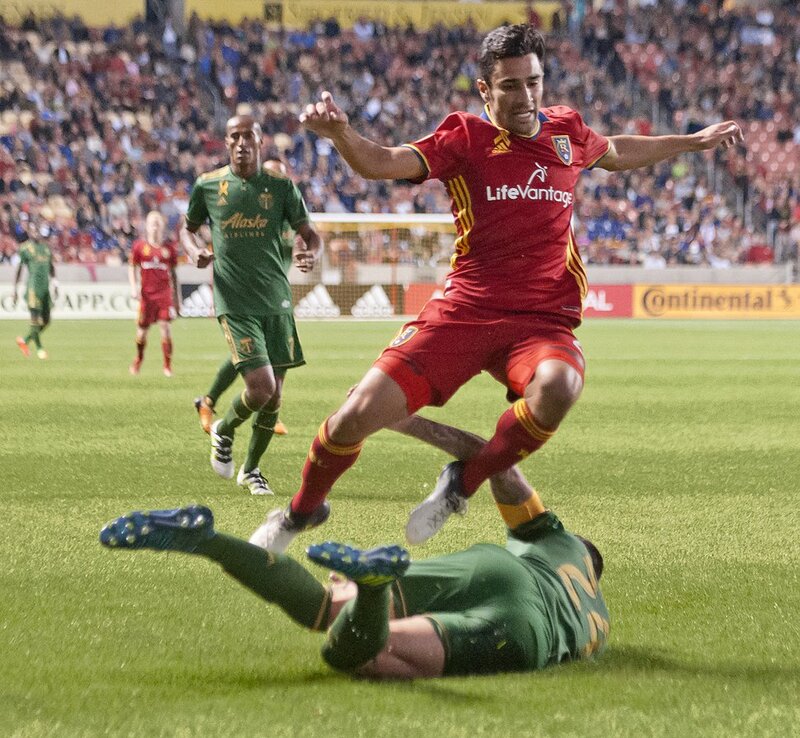 (Michael Mangum | Special to the Tribune) Real Salt Lake defender Tony Beltran (2) leaps over a sliding Portland Timbers defender Liam Ridgewell (24) during their MLS match at Rio Tinto Stadium in Sandy, UT on Saturday, September 16, 2017. Initially, Cooper was only supposed to reconstruct Beltran’s ACL and repair his LCL. But due to the bone avulsion, Cooper was forced to reconstruct his LCL as well, increasing the timetable of his return. Teal Beltran remembers receiving a text message from Cooper with the news and later seeing her husband after the second surgery. “I had never seen him in so much pain,” Teal Beltran said. Cooper told Beltran it would be about a year until he’d have an idea of whether or not his knee would be OK. In the first few months of that span, as he lay bedridden and largely immobile, Beltran received emotional and moral support from every direction. RSL coach Mike Petke visited his home soon after his injury and gifted him a book. RSL television analyst Brian Dunseth shoveled his driveway after an epic snowstorm. Someone even anonymously sent him a prayer book via Amazon. Beltran tried to keep himself busy during his recovery. He honed his parenting as he spent much more time with his family, which he said is the only aspect of his life that brings him peace other than soccer. He also started a podcast through the club where he discussed books and movies with his teammates. Once his body was well enough to begin rehab, he threw himself into it. But it wasn’t until he was finally cleared to shed the large metallic knee brace he wore for months that he felt confident of his return to full strength. “I felt like a caged bird that was now flying again,” Beltran said. The organization last month brought Beltran back on a two-year deal, but it wasn’t a foregone conclusion that he would return to RSL. After the club declined his option for this season and left him unprotected in the expansion draft, Beltran found himself as a free agent for the first time in his 12-year career. Staying with RSL was his main priority, but other teams constantly knocked at his door. Toronto FC made the biggest push to acquire Beltran’s services, and he said he was “close” to joining another team. He asked the opinion of his best friend, Brandon Gonzalez, who told him if it didn’t work out with RSL, the next best option for the Claremont, Calif., native would be to play for one of the two Los Angeles teams. But Salt Lake City was home for Beltran, who has spent the last 12 years building a life and community here. “It would be tough to throw that away on a whim for someone in my position after this injury going into the latter half of their career — maybe the latter third or fourth of their career — to go on an adventure somewhere else,” Beltran said. Discussions with general manager Craig Waibel were matter-of-fact and fluid, Beltran said. Waibel said it was important to keep Beltran due to his professionalism, experience, self-care and character. When asked if Beltran’s recent injury history had any bearing on whether or not to re-sign him, Waibel said the diligence he showed to make his return gave the organization confidence to bring him back. 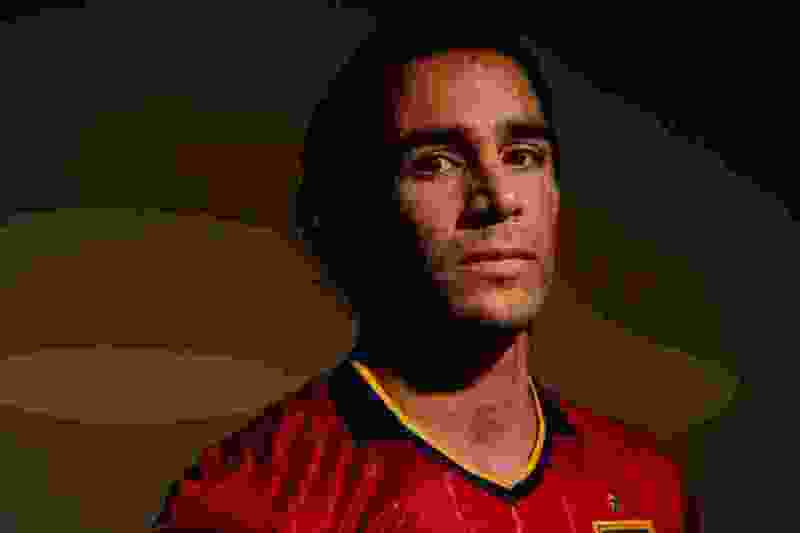 Many of the younger RSL players go to Beltran with practically every question imaginable. If someone needs advice about what to eat, or how to do taxes, or what to do at the post office, or figuring out the real estate market, Beltran is there to help. Last season, Justen Glad asked Beltran what Bitcoin was and whether or not it was smart to invest in it. That’s why every conversation about Beltran does not end until someone mentions his impact off the field. Despite not spending a single second playing soccer last year, Beltran made it a point to be a positive influence in the locker room and keep himself in the loop as much as possible. One of his projects was staring a book club with Glad, Jordan Allen and Andrew Brody, who plays for the Real Monarchs. Glad describes Beltran’s willingness to be a constant resource as “selfless.” He’s not the only who thinks that of Beltran. His two closest friends, Gonzalez and Joshua Feinauer, have dozens of examples of just how much Beltran puts others before himself. Career: Drafted third overall by RSL in 2008; started in 230 of 245 games; played entire career with one team. Like when Gonzalez got engaged on Christmas night a few years ago and drove to Beltran’s childhood home to deliver the news. He merely wanted to share the moment with his best friend, but Beltran surprised him with a house full of 15 of his closest friends. Or when he would help plan elaborate outings or parties with themes from certain television shows, game shows or movies just because one of his friends was a fan of one. “He's always someone that kind of goes out of his way to make sure that people feel valued and appreciated,” Gonzalez said. Nick Rimando, who Beltran practically idolized growing up, said the team is happy to have him back in full force for this season, particularly for his presence on road trips. He thinks it’s not only the young players who benefit from Beltran’s sage presence. “He’s somebody that all these young guys can look up to and even some of the veterans that could look at him and see what he does and how he performs,” Rimando said. On the second day of training camp at UCLA, where he spent three years and majored in history before RSL drafted him third overall in the 2008 MLS draft, Beltran receives a pass on the right side of the field, shimmies past his defender ever so slightly and puts a ball in the back of the net. It’s a small sample size of a fully healthy Beltran, but it could be a sign of what’s to come to 2019. He’ll have to fight for a spot with fellow right back Brooks Lennon, who moved into his spot last season due to his injury. But his teammates are already looking forward to what he can bring on the field. Beltran is long removed from his freshman days at Claremont High, where former coach Fred Bruce-Oliver had no choice but move him up to varsity because of natural talent, a move unheard of on his team at the time. He’s even further removed from impressing his former youth skills coach, Bill Swartz, with his “burning desire to be the best” and his ability to complete a three-touch drill with jumping in the air, settling the ball with chest and turning the opposite direction at just 8 years old. Now, Beltran feels “like a kid again,” appreciative that he still gets to play soccer. He said the injury tempered his expectations for his 2019 return, and that he won’t put a number on the amount of minutes of games he wants to play. But Beckerman may have said it best when describing what the team and the RSL faithful can expect when they see him back on the field.